Domestic sheep and a cow pastured together in South Africa. Livestock (singular or plural) is any domesticated mammal intentionally reared in an agricultural setting for the purposes of profit or subsistence, whether for food, fiber, dairy, draft, breeding, sport purposes, or other product or labor. As such, livestock includes animals such as cattle, horses, sheep, and fur-bearing animals, but does not include farmed birds (turkeys, chickens, pigeons, geese), fish, shellfish, amphibians (frogs), and reptiles. It also does not include animals kept as pets. However, the term is not rigorously applied in all contexts and inclusion of poultry as livestock is not uncommon. And in many cases ratites (emus, ostriches, rheas) are considered as livestock when raised in an agricultural setting, even when poultry are not counted (IRS). Raising animals (animal husbandry) is an important component of modern agriculture. It has been practiced in many societies, since the transition to farming from hunter-gather lifestyles. The ability to raise livestock has enabled the development of human societies and cultures, fostered commerce and international trade, and provided a steady source of food, labor, and other products for people. However, in recent years there has been a greater awareness of the need to address environmental concerns from the impact of livestock and their rearing as well as ethical concerns regarding the treatment of livestock. The term "livestock" is nebulous and may be defined narrowly or broadly. On a broader view, livestock refers to any breed or population of animal kept by humans for a useful, commercial purpose. This can mean domestic animals, semi-domestic animals, or captive wild animals. Semi-domesticated refers to animals which are only lightly domesticated or of disputed status. These populations may also be in the process of domestication. In practical discussions, some people may use the term livestock to refer just to domestic animals or even just to red meat animals. In the United States, the Internal Revenue Service of the Department of the Treasury defines livestock as including "cattle, hogs, horses, mules, donkeys, sheep, goats, fur-bearing animals, and other mammals." It further notes that the term "does not include poultry, chickens, turkeys, pigeons, geese, other birds, fish, frogs, reptiles, etc." (Treasury Regulation section 1.1231-2(a)). In addition, section 1231(b)(3) of the Internal Revenue Code specifically excludes poultry from the definition of livestock and Treasury Regulation Section 1.1231-2(a)(3) broadens the term "poultry" to include "other birds" (IRS). Furthermore, IRS Publication 225, Farmer's Tax Guide states that livestock does not include chickens, turkeys, emus, ostriches, rheas, and other birds. However, the IRS does treat ratites as livestock for some tax purposes and also notes that many states do classify ratites as livestock for state regulatory purposes (IRS). The IRS lists as "alternative livestock" a wide range of animals being marketed for pets, show, or sports purposes, many of which are not mammals, including parrots and alligators (IRS). The following are some of the more well-known animals considered to be livestock. Livestock are defined, in part, by their end purpose as the production of food or fiber, or labor. Livestock can be raised for the production of a useful form of dietary protein and energy. Livestock can be used as a source of milk, which can in turn easily be processed into other dairy products, such as yogurt, cheese, butter, ice cream, kefir, and kumis. Using livestock for this purpose can often yield several times the food energy of slaughtering the animal outright. Livestock produce a range of fiber/textiles. For example, sheep and goats produce wool and mohair; cows, deer, and sheep can make leather; and bones, hooves and horns of livestock can be used. Manure can be spread on fields to increase crop yields. This is an important reason why historically, plant and animal domestication have been intimately linked. Manure is also used to make plaster for walls and floors and can be used as a fuel for fires. The blood and bone of animals are also used as fertilizer. Animals such as horses, donkey, and yaks can be used for mechanical energy. Prior to steam power livestock were the only available source of non-human labor. They are still used for this purpose in many places of the world, including plowing fields, transporting goods, and military functions. The grazing of livestock is sometimes used as a way to control weeds and undergrowth. For example, in areas prone to wild fires, goats and sheep are set to graze on dry scrub which removes combustible material and reduces the risk of fires. Livestock may be kept for the commercial value of breeding the animals, such as in horse breeding. Livestock may be raised for sports purposes, such as raising horses for horse racing or polo. Livestock may be raised to be sold commercially as pets. During the history of animal husbandry many secondary products have arisen in an attempt to increase carcass utilization and reduce waste. For example, animal offal and non-edible parts may be transformed into products such as pet food and fertilizer. In the past such waste products were sometimes also fed to livestock as well. However, intra-species recycling poses a disease risk, threatening animal and even human health. Due primarily to BSE (mad cow disease), feeding animal scraps to animals has been banned in many countries, at least in regards to ruminants and pigs. Farming practices vary dramatically worldwide and between types of animals. 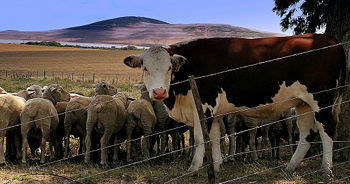 Livestock are commonly kept in an enclosure, fed by human-provided food, and are intentionally bred, but some livestock are not enclosed, or are fed by access to natural foods, or are allowed to breed freely, or any combination thereof. Livestock raising historically was part of a nomadic or pastoral form of material culture. The herding of camels and reindeer in some parts of the world remains unassociated with sedentary agriculture. The transhumance form of herding in the Sierra Nevada Mountains of California still continues as cattle, sheep, or goats are moved from winter pasture in lower lying valleys to spring pasture and summer pasture in the foothills and alpine regions as the seasons progress. Historically, cattle were raised on the open range in the Western United States and Canada, as well as on the Pampas of Argentina and other prairie and steppe regions of the world. The enclosure of livestock in pastures and barns is a relatively new development in the history of agriculture. When cattle are enclosed, the type of "enclosure" may vary from a small crate, a large fenced pasture, or a paddock. The type of feed may vary from natural growing grass, to highly sophisticated processed feed. 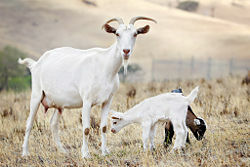 Animals are usually intentionally bred through artificial insemination or through supervised mating. 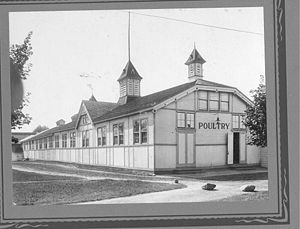 Poultry Building, Western Fair 1923. Indoor production systems are generally used only for pigs and poultry, as well as for veal cattle. Indoor animals are generally farmed intensively, as large space requirements would make indoor farming unprofitable and impossible. However, indoor farming systems are controversial due to the waste they produce, odor problems, the potential for groundwater contamination, and animal welfare concerns. Other livestock are farmed outside, although the size of enclosure and level of supervision may vary. In large open ranges, animals may be only occasionally inspected or yarded in "round-ups" or a muster. Working dogs such as border collies and other sheep dogs and cattle dogs may be used for mustering livestock, as are cowboys, stockmen, and jackaroos on horses, or with vehicles, and also by helicopters. Since the advent of barbed wire (in the 1870s) and electric fence technology, fencing pastures has become much more feasible and pasture management simplified. Rotation of pasturage is a modern technique for improving nutrition and health while avoiding environmental damage to the land. In some cases very large numbers of animals may be kept in indoor or outdoor feeding operations (on feedlots), where the animals' feed is processed, offsite or onsite, and stored on site then fed to the animals. Livestock, especially cattle, may be branded to indicate ownership and age, but in modern farming identification is more likely to be indicated by means of ear tags than branding. Sheep are also frequently marked by means of ear marks and/or ear tags. As fears of mad cow disease and other epidemic illnesses mount, the use of microchip identification to monitor and trace animals in the food production system is increasingly common, and sometimes required by governmental regulations. Modern farming techniques seek to minimize human involvement, increase yield, and improve animal health. Economics, quality, and consumer safety all play a role in how animals are raised. Drug use and feed supplements (or even feed type) may be regulated, or prohibited, to ensure yield is not increased at the expense of consumer health, safety, or animal welfare. Practices vary around the world; for example, growth hormone use is permitted in the United States but not in stock to be sold to the European Union. Livestock farmers had suffered in the hands of wild animals and rustlers. In North America, gray wolf, grizzly bear, cougar, black bear, and coyote are sometimes considered a threat to livestock. In Eurasia and Africa, wolf, brown bear, leopard, tiger, lion, dhole, black bear, spotted hyena, and others caused livestock deaths. In Australia, the dingo, foxes, Wedge-tailed Eagles, hunting and domestic dogs (especially) cause problems for grazers. In Latin America, feral dogs cause livestock deaths. Maned wolves, cougars, jaguars, and spectacled bears are blamed for livestock deaths. Livestock diseases compromise animal welfare, reduce productivity, and in rare cases can infect humans. Animal diseases may be tolerated, reduced through animal husbandry, or reduced through antibiotics and vaccines. In developing countries, animal diseases are tolerated in animal husbandry, resulting in considerably reduced productivity, especially given the low health-status of many developing country herds. Gains in productivity through disease management is often a first step taken in implementing an agriculture policy. Disease management can be achieved through changes in animal husbandry. These measures may aim to control spread by controlling animal mixing, controlling entry to farm lots and the use of protective clothing, and quarantining sick animals. Disease management may be controlled by the use of vaccines and antibiotics. Antibiotics may also be used as a growth-promoter. The issue of antibiotic resistance has limited the practices of preventative dosing such as antibiotic-laced feed. Countries will often require the use of veterinary certificates before transporting, selling, or showing animals. Since many livestock are herd animals, they were historically driven to market "on the hoof" to a town or other central location. During the period after the American Civil War, the abundance of Longhorn cattle in Texas and the demand for beef in Northern markets led to the popularity of the Old West cattle drive. The method is still used in some parts of the world, such as Latin America. Truck transport is now common in developed countries. Local and regional livestock auctions and commodity markets facilitate trade in livestock. In other areas livestock may be bought and sold in a bazaar, such as may be found in many parts of Central Asia, or a flea market type setting. Stock shows and fairs are events where people bring their best livestock to compete with one another. Organizations like 4-H, Block & Bridle, and FFA encourage young people to raise livestock for show purposes. Special feeds are purchased and hours may be spent prior to the show grooming the animal to look its best. In cattle, sheep, and swine shows, the winning animals are frequently auctioned off to the highest bidder and the funds placed into a scholarship fund for its owner. Animal-rearing has its origins in the transition of societies to settled farming communities rather than hunter-gatherer lifestyles. Animals are "domesticated" when their breeding and living conditions are controlled by humans. Over time, the collective behavior, life cycle, and physiology of livestock have changed radically. 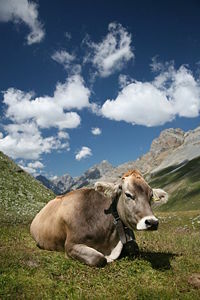 Many modern farm animals are unsuited to life in the wild. Dogs were domesticated in East Asia about 15,000 years ago. Goats and sheep were domesticated around 8000 B.C.E. in Asia. Swine or pigs were domesticated by 7000 B.C.E. in the Middle East and China (DAS 2008). The earliest evidence of horse domestication dates to around 4000 B.C.E. The issue of rearing livestock for human benefit raises the issue of the relationship between humans and animals, in terms of the status of animals and obligations of people. Animal welfare is the viewpoint that animals under human care should be treated in such a way that they do not suffer unnecessarily. What is "unnecessary" suffering may vary. Generally though, the animal welfare perspective is based on an interpretation of scientific research on farming practices. By contrast, animal rights is the viewpoint that using animals for human benefit is, by its nature, generally exploitation regardless of the farming practice used. It is a position based on anthropomorphism, in which individuals seek to place themselves in the position of an animal. Animal rights activists would generally be vegan or vegetarian, whereas it is consistent with the animal welfare perspective to eat meat depending on production processes. Animal welfare groups generally seek to generate public discussion on livestock rearing practices and secure greater regulation and scrutiny of livestock industry practices. Animal rights groups usually seek the abolition of livestock farming, although some groups may recognize the necessity of achieving more stringent regulation first. Animal welfare groups, such as the Royal Society for the Prevention of Cruelty to Animals (RSPCA) or the American Society for the Prevention of Cruelty to Animals (ASPCA), are often—in first world countries—given a voice at governmental level in the development of policy. Animal rights groups find it harder to find methods of input, and may go further and advocate civil disobedience or violence. Confinement of livestock in small and unnatural spaces. For economic or health reasons, animals may be kept in a minimum size of cage or pen with little or no space to exercise or engage in normal actions or grooming. Close confinement is most common with chickens, pigs, and calves raised for veal. Unnatural living environments. Even when allowed to move, animals may be denied a natural environment. For example, ducks may be kept in free-range barns but have no access to water in which to swim. Cattle may be kept in barns with no chance to graze. Dogs or cats may be kept indoors with no chance to hunt. Overuse of pharmaceuticals and hormones. Intensive raising of livestock may lead to a health problems and the necessity to use antibiotics to prevent disease. In some cases, antibiotics and hormones are also fed to livestock to produce rapid weight gain. Overwork and exhaustion of animals. Where livestock are used as a source of power, they may be pushed beyond their limits to the point of exhaustion. The public visibility of this type of abuse lead to this being one of the first areas to receive legislation in the nineteenth century in European countries, although it still goes on in parts of Asia. Modification to the bodies of living animals. Broiler hens may be de-beaked, pigs have deciduous teeth pulled, cattle de-horned and branded, dairy cows and sheep have tails cropped, merino sheep mulesed, many types of male animals castrated. To secure bile for Traditional Chinese Medicine, bears may have a tube or metal inserted into their abdomen to capture bile from the gallbladder, or it may be allowed to seep freely from an open wound created by pushing a hollow steel stick though the bear's abdomen. Long distance transportation of livestock. Animals may be transported long distances to market and slaughter. Overcrowded conditions, heat from tropical-area shipping and lack of food, water and rest breaks have been subject to legislation and protest. Slaughter of livestock. Slaughter was an early target for legislation. Campaigns continue to target Halal and Kosher religious ritual slaughter. The raising of livestock has environmental impacts in terms of land degradation and erosion, pollution, and change of biodiversity. For example, cattle grazing in an open environment may selectively choose more palatable plants for consumption, fostering a change in the diversity of plants. And pollution from chicken farms can pollute nearby streams. According to the 2006 United Nations report "Livestock's Long Shadow," the livestock sector (primarily cattle, chickens, and pigs) emerges as one of the top two or three most significant contributors to our most serious environmental problems, at every scale from local to global. The report recommends an immediate halving of the world's livestock numbers, in order to mitigate the worst effects of climate change. Livestock is responsible for 18 percent of the world’s greenhouse gas emissions as measured in CO2 equivalents. By comparison, the world's entire transportation sector emits 13.5 percent of the CO2. Agriculture produces 65 percent of human-related nitrous oxide (which has 296 times the global warming potential of CO2) and 37 percent of all human-induced methane (which is 23 times as warming as CO2). It also generates 64 percent of the ammonia, which contributes to acid rain and acidification of ecosystems. The findings of the United Nations report suggest that addressing the issue of livestock should be a major policy focus when dealing with problems of land degradation, climate change and air pollution, water shortage, water pollution, and loss of biodiversity. Department of Animal Science (DAS). 2008. Swine Oklahoma State University, Department of Animal Science. Retrieved August 30, 2008. Internal Revenue Service. n.d. Market Segment Specialization Program (MSSP). Training 3123-003 (4-00). TPDS No. 85127K. General livestock US Department of the Treasury. Retrieved August 30, 2008. NSW Department of Primary Industries. 2005. Livestock NSW Department of Primary Industries. Retrieved August 30, 3008. This page was last modified on 7 September 2008, at 20:20.